Speaking in the tongue of Christianity in an age of pluralism, the praying citizens of Greece, New York knew enough to keep it vague when bringing their supplications to town council. Winnifred Sullivan’s reflections on the legal wrangling over public prayer in the town council of Greece included examples of how Christians prayed for their town leaders to be “filled with the spirit of wisdom” and asked that their neighbours would come to see the virtues of “interrelationship.” Though recognizably Christian, these prayers addressed to a “Heavenly Father” were nevertheless “tamed by the law,” as Sullivan puts it, in their avoidance of Jesus-language and their studied evasion of deity specificity (except in terms of their gendered language of kinship). Heading northward across Lake Ontario to Toronto, home of an infamous mayor, the idea of turning to banal, or better yet prophetic, prayers to bring some order to the chambers of City Hall seems like an eminently sensible plan. 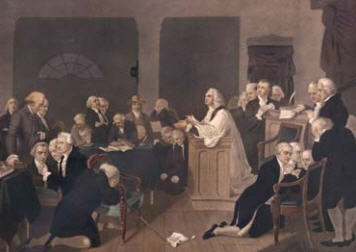 At a time when many politicians converse with each other in a manner disrespectful, mocking, and even lewd—when they care more about how their words will translate to sound bites and celebrity than how their exchanges will forward the cause of deliberative democracy—perhaps the call to prayer in public could also be understood as a call for genre intervention and not only divine intervention.